As is the trend here in the Côte d'Azur, this past fun-filled week has flown by! A week ago, we said goodbye to our three-week students, and settled in for our last week here with our families. However, we did not let our three-week student leave us without showcasing some of their amazing talents! Last Monday, students, staff, and families joined to applaud the Talent Show organized by our students. There was singing, dancing, a secret handshake, martial arts, gymnastics, and even a guacamole making contest! Afterwards, we were treated to a spread of Niçoise specialities at a pot-luck dinner. After classes on Tuesday, students headed to a local retirement home to interact with some of the locals. 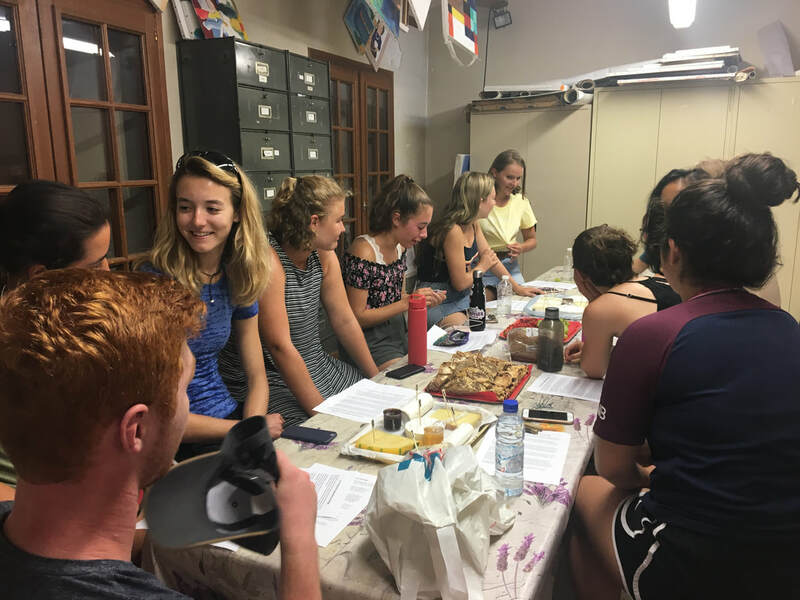 They were happy to share their French skills with the members of this community, as well as some of the things they have learned here in SLDV. On Thursday, many of our students chose a cheese-tasting workshop for their afternoon activity. There, they learned about the different steps of cheese tasting, the many types of cheese, and how to pair them with France's gourmet breads, spreads, and fruit. Some of the cheeses were more appreciated than others (especially in regard to the smell! ), but all students were happy to discover new favorites among the varieties. On Friday evening, students attended the annual Black and White Party at the Cagnes-sur-Mer youth center. By the end, all were covered head to toe in white foam! 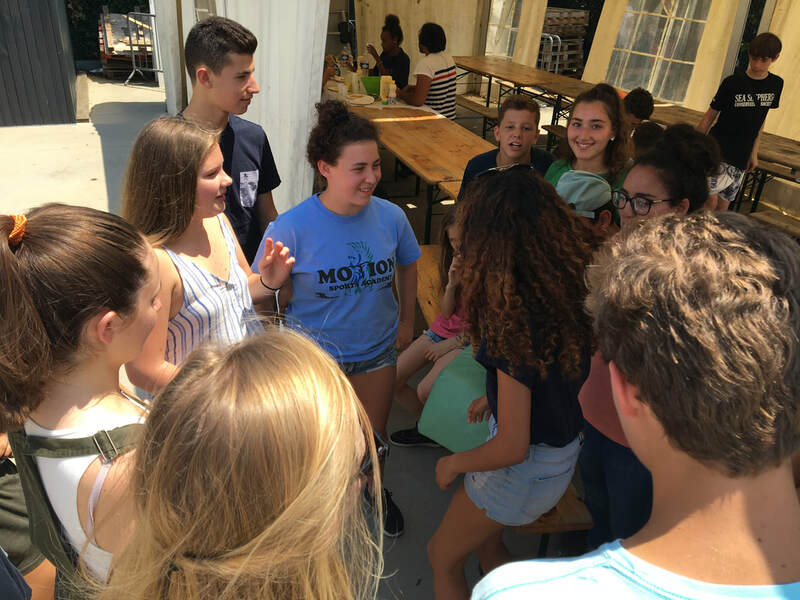 They had a blast dancing, singing, and meeting other French teenagers their age. We had an early morning the next day, as we took off for San Remo, Italy! There, students enjoyed a free day in the coastal town. From what we were told, the majority of it was spent tasting the local cuisine and savoring authentic cappuccinos. We can't blame them! 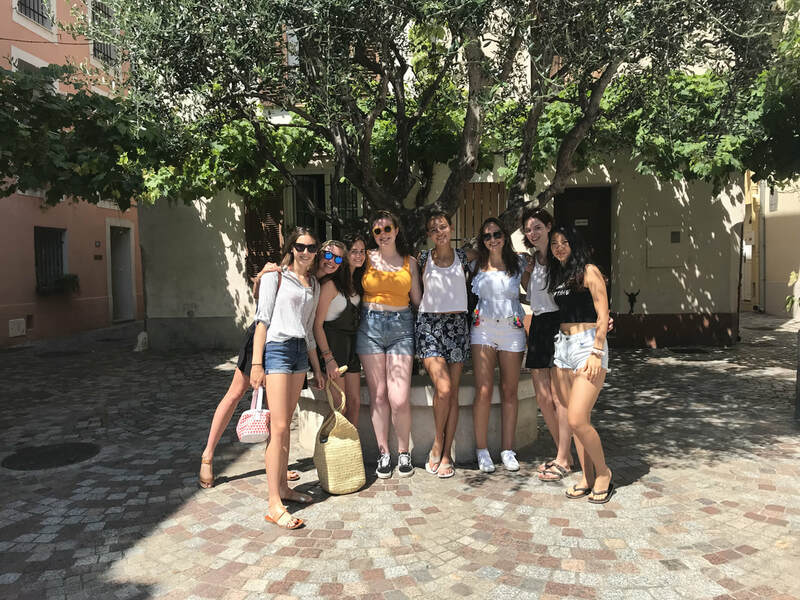 On Sunday, we headed to the hill town of Saint Paul de Vence where we toured the beautiful medieval town and visited the Maeght Foundation, a haven for contemporary art. Finally, for our last full day as a group, we headed to one of our favorites, Nice, to enjoy the pebbled beaches, shopping, and of course more food! We ended the afternoon with a trip to a local ice cream shop, then said some goodbyes at the SLDV train station. As I write this, our students are all headed back home, or to other destinations in the world to continue their travels. Saying goodbye was difficult, and there were many tears, but we are all so thankful to have shared this time together. We could not be prouder of our students and all they did to overcome the language barrier, cultural differences, and homesickness. 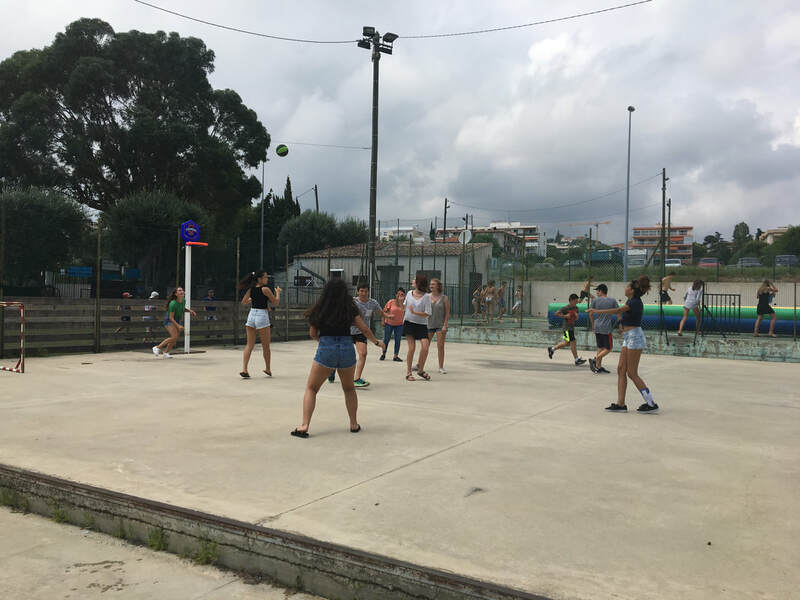 They made incredible progress in French, became a part of their families here in SLDV, shared many wonderful cultural experiences, and made friends for life. From all of us at Abbey Road, we wish everyone the best in their future adventures! Never stop exploring, and make the most of every second. Looking forward to another fun weekend! Bonjour à tour et à toutes ! After our fun Socca tasting class on Tuesday afternoon, we spent dinner time with families and then headed back into town for an evening at our favorite place, The Django. We can say without a shadow of a doubt that all of our students love to dance! This week we also enjoyed a visit to La Passerelle, a cultural center in The Port neighborhood of Nice filled with colorful paintings, books, wacky chairs, and some very talented artists. There, we were treated to a private concert boasting classic French variety music from throughout the years. Our students were also invited to participate, which some did gladly! We will have our own talent show coming up next week, and I look forward to seeing all of our students in the spotlight. With another week behind us in Saint Laurent, I think we are all a bit tired, but very much looking forward to a fun-filled weekend! Tomorrow, we will be visiting Monaco and Èze, and on Sunday, Villefranche. Already saying au revoir...and bonjour ! Another week begins at Abbey Road in Saint Laurent! Still riding on the waves of the World Cup excitement, we started the week with classes as usual, then took another trip to Nice on Monday (there is so very much to see there!) for Art electives and a visit of the Matisse Museum. This morning, we began with some tearful goodbyes. It is hard to believe that our two-week students are already making their way back home today! We were very sad to see them go, but wish them all the best as they continue their summer. Certainly, as the pictures show, our students have made friends for life in their fellow students and host families. We are also saying hello to two new students this week, one of whom joined us this afternoon for our tasting of Niçoise specialties, Socca cooking class, and tiramisu at the home of one of our host families. I think it is safe to say that no one left hungry! Tomorrow, we will welcome our last new student to the program, and continue with our language courses as planned. In the afternoon, students will visit a sea-front youth center in the sand, and make the most of another fun afternoon at the beach. Pictures will be sure to follow! Until then, à bientôt! Second weekend in the books! As expected, time is absolutely flying here in Saint Laurent! It is hard to believe that we will already have to say goodbye to several of our two-week students, but we will certainly make the most of our last day with them tomorrow. Last Thursday, we had dinner reservations at a local Thai restaurant, and I can whole-heartedly say that even Thai food tastes better in France! Even better than the fried banana nems for dessert were our karaoke singers who entertained us well into the evening. On Friday, we took a few of our two-week students to Monaco and the Fragonard perfumery in Èze. Not to worry for our other students! We will be heading back with the rest of our students next week. 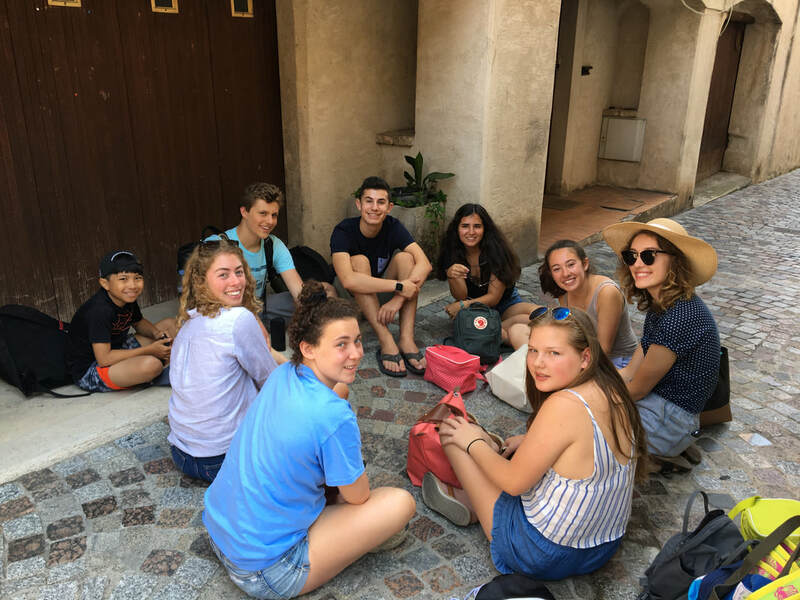 To begin our weekend, we organized a treasure hunt in Nice in conjunction with the Nice residential program, followed by a beach picnic for us all. A group of our students came in first place! On Saturday, we spent the day in the famous Saint Tropez! I think the majority of us mostly enjoyed the food (tarte tropézienne! ), some shopping, and strolling through the picturesque streets of the small but famous towns. We were even able to catch a photo op outside of Chanel. Finally, after dinner with their families, students set back out to celebrate the 14 juillet! There was music, fireworks, and of course, more desserts. Today, we ended our weekend with a relaxing day at the Lac de Saint Cassien. We enjoyed the lake's obstacle course, peddle boats with slides, and kayaks. I think we all gave the snack bar quite a bit of business as well! 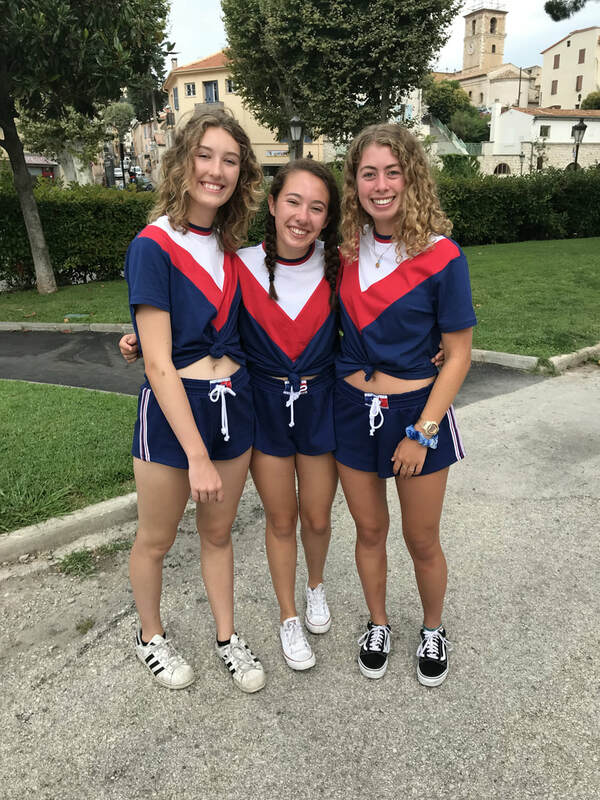 Students went home in the late afternoon to get ready for the World Cup Final with their host families. On est les champions! It was a fabulous way to end the weekend, and we're looking forward another fun week in Saint Laurent. A bientôt! Though we are running off to a dinner reservation after another exciting day here in Saint Laurent, I thought I would share some photos from the last few days. Enjoy, and à très bientôt ! What a fun-filled and busy weekend we have had on the Côte d'Azur! While we have seen and done so very much, I will try my best not to be long-winded. We began on Friday with a visit of Saint-Laurent-du-Var and a private tour of "La Mairie," the town's city hall. There, we met with Madame Françoise Benne, Adjointe to the mayor of the town. Our students even had the privilege of sitting in the seats occupied by the Conseillers Municipal of the city! That afternoon we headed to Nice where some of our students completes their first day in their digital photography and studio art classes. The remaining students participated in a guided tour of la confiserie Florian, a local tradition. There, we were introduced to their different products (including tastings!) as well as their production methods. Our afternoon in Nice ended with the France win over Uruguay in the World Cup! The excitement was contagious! On Saturday we headed to the famous city of Cannes. 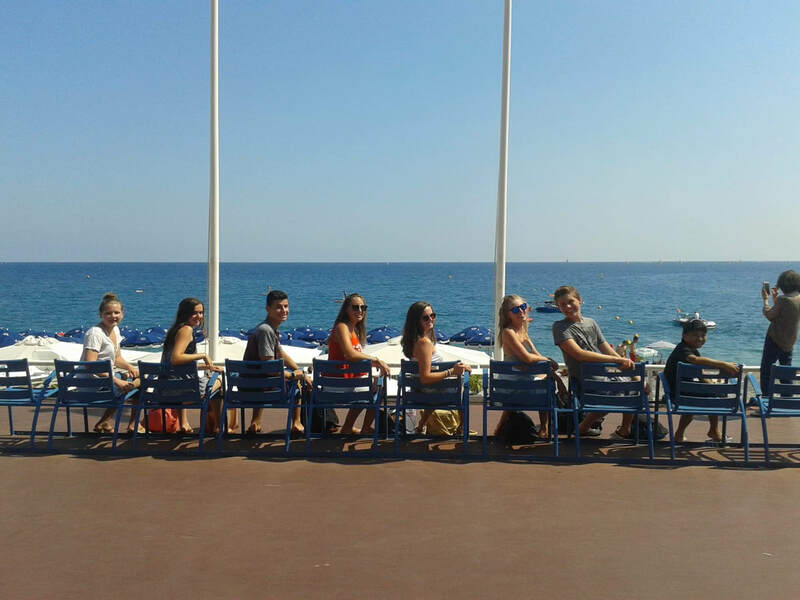 First, our students followed in the footsteps of world-renowned stars on the red carpet of "les marches" of Cannes. Afterwards we hiked up to the highest point of the city in order to benefit from the best view. 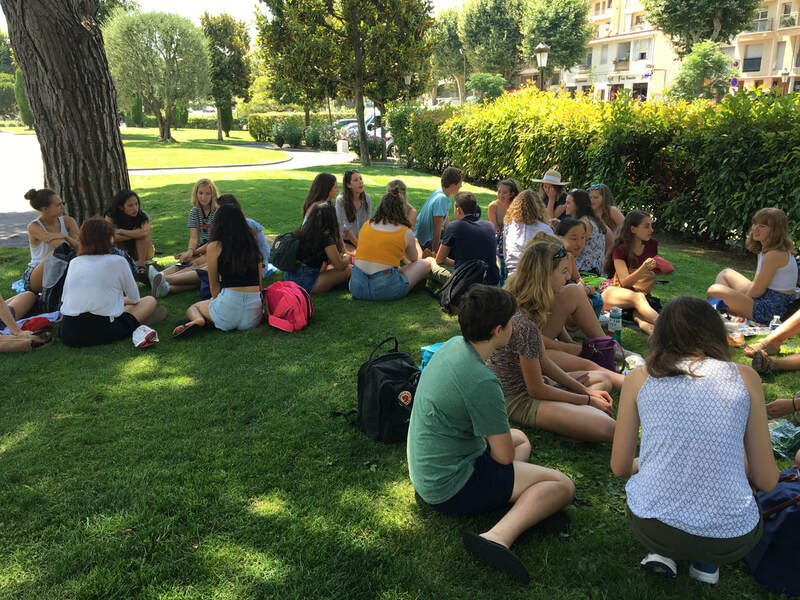 Afterwards, everyone enjoyed lunch in town or picnics in the shade, shopping on the famous "Rue d'Antibes" and some much needed beach time. To finish out our day. We made our way to Cagnes-sur-Mer for La Fête de la St. Pierre. Between dinner, ice cream, a parading rock band and a firework finale, we thoroughly enjoyed the local holiday. To end our busy weekend, we headed to the nearby town of Antibes for a visit of the Marché Provençale, the Musée Picasso, and another (excellent!) afternoon at the beach. At the Picasso museum, students broke into groups to choose their favorite piece of artwork. Together, they worked to create descriptions of the pieces they chose to create their own guided tour. All did a fabulous job, and celebrated with macarons from the Marché. Our weekend concluded with some relaxing beach time and a night for students with their families. We look forward to beginning our official classes this week, and to all the excitement in store! Bonjour à tour et à toutes ! Everyone arrived by yesterday evening, and we spent a very successful first day in Saint-Laurent-du-Var! First, we conducted our orientation meeting and placement testing in our summer home, Le Centre de la Boulangerie. ...And finally to the Centre Jacquons for an afternoon of games, slips and slide, and cultural exchange with French teenagers. 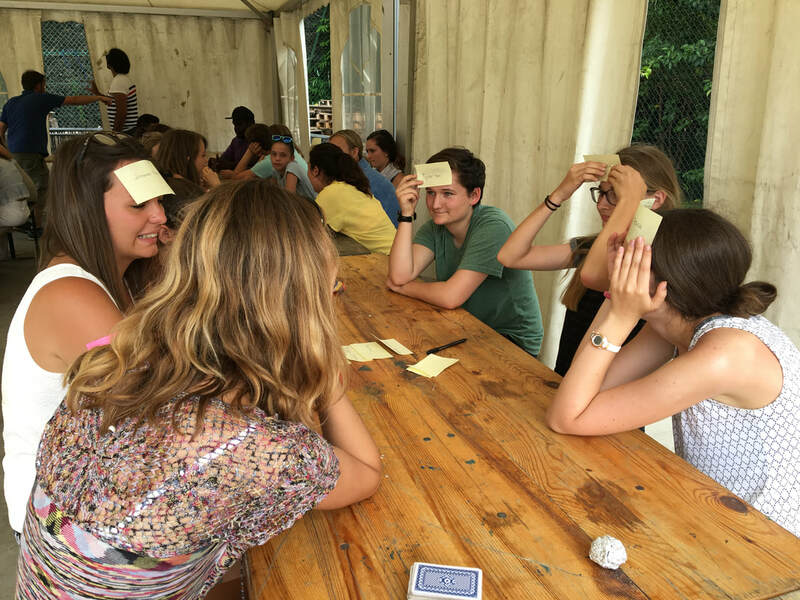 Finally, there were snacks (le goûter) and even... a table slapping game? In any case, we had a great day, and we hope you did, too! We're looking forward to our visit of Nice tomorrow. Until then...tchao ! As we settle into Saint Laurent, I hope you all are having fun barbecuing with family and friends to celebrate the Fourth of July back at home! Though our celebrations here will be limited, we are all excited to be in the South of France and are looking forward to many fun and enriching activities on the horizon. 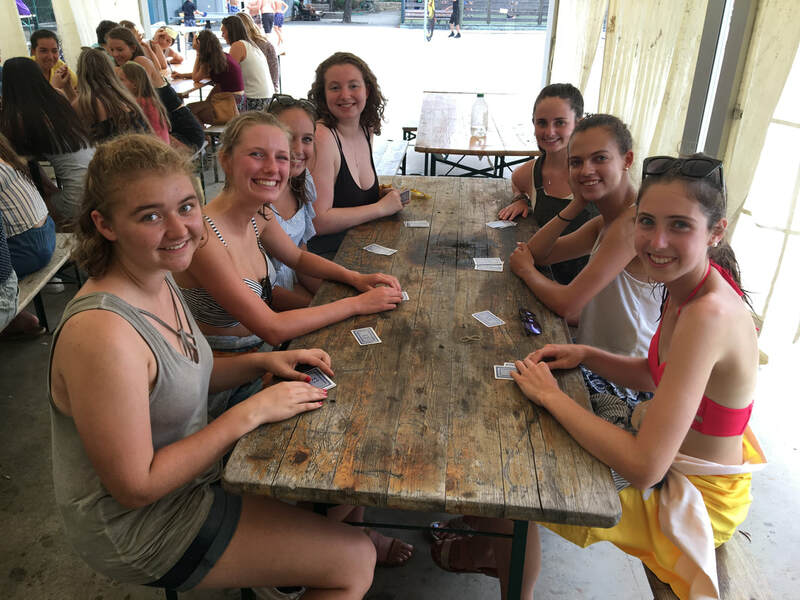 We are still awaiting a few late arrivals this evening, but the majority of our students are here and they have spent the day relaxing with their new host families. Students have been unpacking, relaxing, and in many cases getting to know their roommates. Not to mention the several brave students who are not scared of jet-lag! They have been swimming, have checked out the nearby beach, and have spent time touring the city. However, I'm quite sure that everyone will sleep well tonight. Tomorrow, our busy schedule commences! In the morning we will hold our orientation meeting, placement testing, and several "icebreaker" activities to begin. 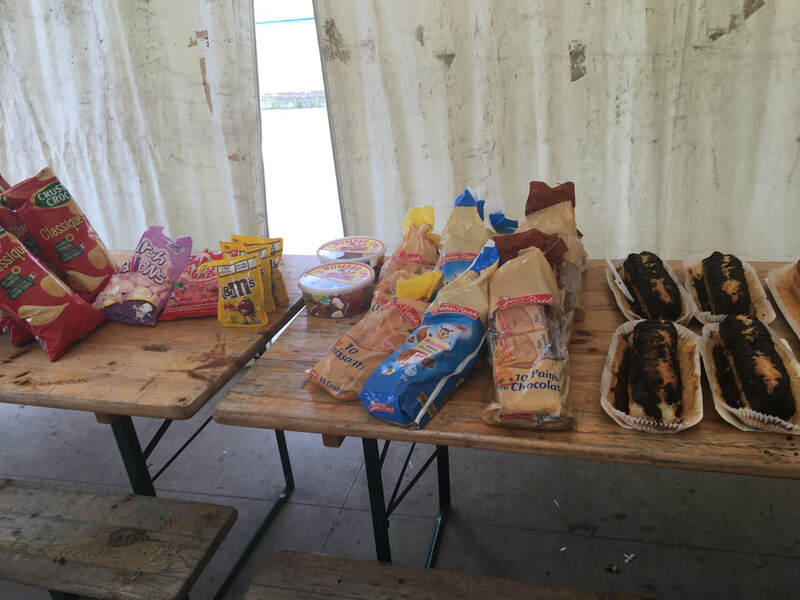 Afterwards, we will enjoy our picnic lunches before heading to the Centre Jacquons for an afternoon of games and cultural exchange with local French teenagers. We will swim, play beach volleyball, and enjoy each other's company! I will be sure to capture our day in pictures and post plenty for all to see. Until then, enjoy your celebrations! C'est bientôt le départ ! I hope you are all getting ready for the trip of a lifetime! In just a few short days we will be heading to Saint-Laurent-du-Var, France for an unforgettable linguistic and cultural journey. Let's not forget the sand and sun that await us on the French Riviera. Along with the many other activities and excursions we have planned, this summer is sure to be one we will not soon forget. To document this journey, voici notre blog ! Here, we will be sharing moments from our adventures so that everyone at home may follow along. Students, you may also find this sight fun to peruse once the program has ended as you reminisce about a summer well-spent. You will see frequent posts, and plenty of pictures to illustrate our time in France. 1. Pack light. Yes, everyone says this, and that is because it pays off! Handling large and heavy luggage is cumbersome. Also, you want to make sure you have plenty of room to bring back souvenirs from your trip. 2. Plan ahead. Make sure you have financial and communication plans in place for the duration of your stay. Will you be exchanging money, or using an ATM/credit card? Will you be using an international plan with your current cell phone carrier, or purchasing a French SIM card? If you plan to purchase a French SIM card, be sure that your phone is compatible, and unlocked. 3. Pack something to share. Maybe it is your favorite candy, a book about the region where you live, or something you have made. Whatever you choose, this can be a great conversation starter as you get to know your family. It will also tell them something about you, and where you come from. 4. Be prepared to speak French. This is vacation, but it is also an incredible opportunity to hone your skills in French. Sure, there will be moments of discomfort and uncertainty, and you will make mistakes, but you will also learn. 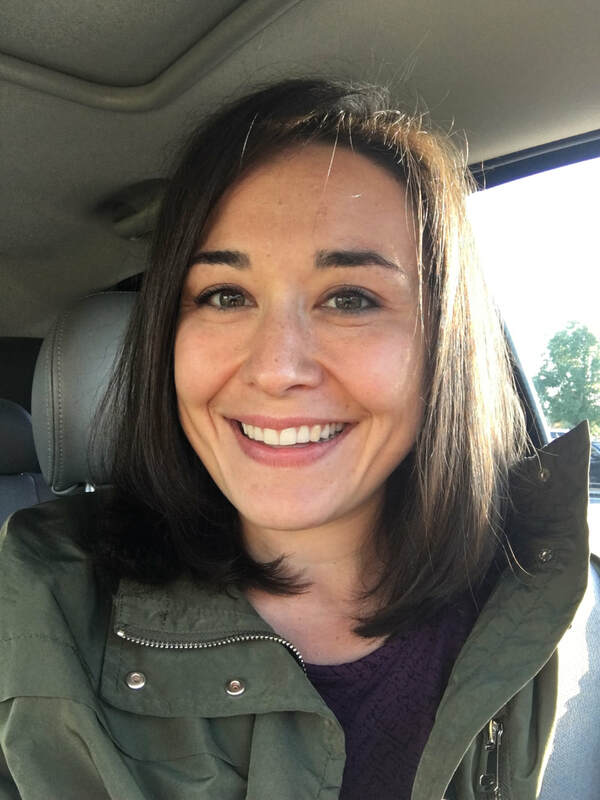 Pack a small notebook, or dedicate a note on your phone to documenting new vocabulary, names of destinations, or anything else memorable you encounter. Step outside of your comfort zone, and you will see amazing progress. Your confidence will soar as you gain fluency in the language. 5. Don't forget your passport. We will double, triple, and maybe even quadruple check for our passports and other documents as we make our way to France. Running the labyrinth of airport security can be confusing, so we want to make sure we are not misplacing items in the process. You should also make a copy (or 2) of the ID page of your passport and store it in your carry-on. If you have any questions in the coming days, please get in touch. I look forward to writing my next post from the Mediterranean, and until then, happy packing!